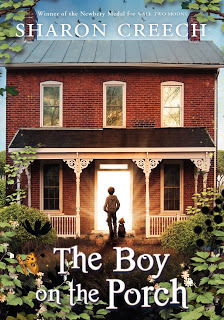 Sharon Creech’s most recent work The Boy on the Porch is calm and sweet and incredibly moving. He is a god good boy. Wil be bak wen we can. Unsure of what to do, John and Marta go about caring for the child hesitantly at first. They search for Jacob’s family, for reports of missing children, but find nothing for months. Jacob is a unique child in that he is either unable or unwilling to speak so John and Marta must discover ways to communicate with him. As they observe Jacob and his remarkable gift for art and music/rhythm they marvel at and delight in him, growing closer together with each passing day. In tone and style The Boy on the Porch is reminiscent of Patricia MacLachlan’s Sarah, Plain and Tall and is closest in theme to Creech’s previous work The Unfinished Angel (which I love). It is really the story of John and Marta and how this small boy on their porch shapes the rest of their lives. It is a story about the power of love and compassion and simple kindness. It is a story about the best in people healing what can be the wreckage inflicted by the worst. It is about loving children and is one of the most truly beautiful stories I have read in a long time. Due to its tone and theme The Boy on the Porch may work better as a read-aloud for younger readers, who probably would not choose it independently. For Sharon Creech fans it’s a must-read! And for those who are not familiar with Creech’s work this is a delightful way to begin!